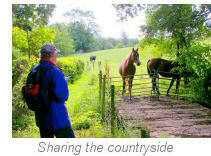 An enjoyable short walk which takes in some attractive countryside and farmland. Mostly flat with dog friendly gates & stiles. 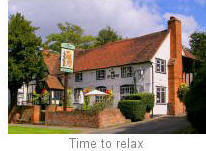 Refreshments are available at the well known Bear Inn in Berkswell. The walk incorporates a short section of the Millennium Way, where you will be guided by the distinctive black Millennium Way way markers. Find out more about this walk by clicking on the information icon. Our walk starts from the car park in Lavender Hall Road, Berkswell, not far from the Bear Inn. Emerging from the car park, cross road and go right past houses to find signed footpath left between two bungalows. Go through narrow passage then through wooden kissing gate. Continue forward to go through metal kissing gate and head up next field with hedge right through a further kissing gate. In the next field stay ahead with hedge right and just before field corner take kissing gate right then go left with hedge left. At the field corner continue around field edge then take kissing gate left into large field staying with hedge and fence left under power lines towards farm buildings. Take kissing gate into farm yard then immediately left to take further kissing gate (marked permissive route) which skirts around the side of the farm building. Continue along side of wooden fencing then exit via stile onto farm track. Go left and continue down farm track. On reaching the surfaced lane cross over to take metal kissing gate opposite then stay ahead to cross directly over centre of large field. Go under power lines to hedge corner and continue ahead now walking with hedge right to pass through a metal kissing gate and over footbridge directly under an oak tree. Having crossed the footbridge take the footpath which continues straight ahead (ignoring the left & right footpaths). Stay ahead, across middle of field, towards a row of trees and walk with hedge left to field corner. Now, stay ahead keeping close to wire fence and hedge left. Take the next metal kissing gate into field. Continue ahead but veering slightly right to take another metal kissing gate to road. 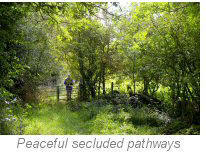 Cross road and take footpath opposite to stay forward along enclosed woodland path. Take three wooden stiles ahead and stay along footpath to take gap in fence. Go left to walk along the path parallel to railway line. On reaching the railway bridge ahead, cross wooden stile and go 1/2 left, across road, to take wooden kissing gate into field. Go ahead up field heading for top right hand corner at end of long red brick wall. Here take the hidden kissing gate right (at the far end of the wall) to reach the road. Turn right on road passing entrance to Moat House Farm opposite. Continue along road and after a short while take the surfaced drive right, next to Jasmine Cottage, and go through large kissing gate into field to stay ahead with trees and fence left. Take corner kissing gate and continue forward along fenced path with hedge left, soon crossing a short section of boarded walkway then exiting by metal kissing gate to farm driveway. Go left along driveway to reach a road. You are now on The Millennium Way. Go left on road to reach a junction. Turn right here to reach the T-junction. Turn left onto Spencer's Lane and after 20 paces take driveway right to cross stile to vehicle track, (From here you will be guided by the distinctive black Millennium Way way markers). Go ahead on track to take kissing gate and ahead to exit track by further kissing gate to field. Go to right of power pole to cross field and find top corner kissing gate. Take this kissing gate / plank bridge / kissing gate and go ahead with fence right & left, ignore kissing gates to left but continue ahead to find kissing gate / plank bridge / kissing gate, then ahead, over rough driveway, keeping hedge and trees right to pass under power lines. Approximately 100 yards after passing under the power lines you will come to a crossroad of paths and a mid hedge gap on right with kissing gate and a way post with several way marks. Stop. Remain in the field then turn left (walking away from the kissing gate and way post) across field to take ditch bridge located 10 paces in from right field corner. Continue ahead with wire fence left across field to exit by kissing gate. Go with hedge right to top right swamp boards and take kissing gate. Go with hedge right and at end of trees take ditch bridge and kissing gate right and then go left continuing with hedge left under power lines. At field corner go ahead over field aiming some 70 paces to right of white house to find corner gap. Ignore gap (here we leave The Millennium Way) and instead go left to carry on around edge of same field with hedge right. After a few yards you will reach a large metal gate and fence stile. At this point go diagonally half left across field to reach far line of trees. On reaching line of trees take kissing gate and go directly ahead over next field to reach a hedge gap. Take gap then immediately bear 1/4 right to reach corner kissing gate and adjacent stile. Take the kissing gate into next field (ignoring the footpath which goes right) then stay straight ahead, first to pass a large lone tree on your left and continuing the same line to pass between a line of large trees in mid field. After passing these trees stay ahead on same line to field corner where the path descends slightly to reach a corner kissing gate. Take kissing gate through short passageway to road. Turn left on road to reach crossroads. You can stop here at The Bear Inn or continue across the crossroads to return to your starting point at the Lavender Hall Lane Car Park. Berkswell An interesting village with a lot of history. Starting at the church of St. John the Baptist, the first item of interest is its timber frame porch, originally the village schoolroom, with benches and hatpegs. Venturing inside, we find a number of examples of the furniture of the ‘mouseman’, Robert Thompson, each adorned with his trademark carved mouse. See how many you can find (there are 9 in all). The two Norman crypts are remarkable. 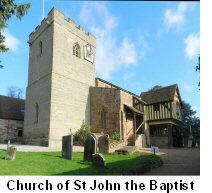 The eastern part was built around 1150 and the octagonal western end later in the same century. 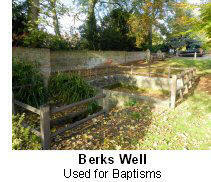 Outside the church is the square stone-walled Berks Well, after which the village is named. It was used for baptisms by immersion (a chilly experience!). 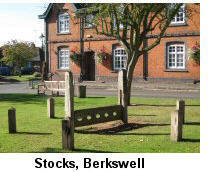 On the village green opposite the shop are the stocks. It is claimed that these were especially built for a one-legged ex-soldier and his two drinking companions as there are only five leg holes. Behind the well, in Lavender Hall Lane, in a sixteenth century cottage is the free village museum, showing local exhibits and history. Notable people from Berkswell include the actor Jeremy Brett, whose roles include Sherlock Holmes in the ITV television drama series. Ram Hall, which is passed about 0.5 miles (800m) southeast of the village, was built about 1600. The short stretches of railway line near Berkswell House and Carol Green are the main Birmingham-Coventry-London route. This was the first inter-city line, engineered by Robert Stephenson in 1838.